You hope to find a selection of local music schools or guitar teachers in your area. But do you know what to look for? Have you thought of all the guitar learning options for your child? What about your child learning guitar right at home? That would save time and money. Should I look for a kids guitar teacher near me? Yes, definitely check out your local options. But before you settle on a teacher near you, also consider kids guitar lessons on Skype with live teachers. Many parents are skeptical when they first hear about Skype lessons with live teachers. After all, isn’t a local teacher near your home always the better option? Finding the right guitar teacher is more important than finding the nearest teacher. Kids and adults don’t learn guitar in the same way. Young kids, under the age of 9, have different learning needs compared to older kids and adults. Your local music school may not have a specialist teacher for the younger age group. Most guitar teachers prefer to work with kids ages 9 and older. So your local teacher may not be the best option for your child if your child is between 5 and 8 years old. If you are looking for the best kids guitar lessons for ages 5 to 8, then try to find a specialist children’s guitar teacher. A specialist guitar teacher has training and experience. It is worth to travel extra distance to work with a specialist teacher. The good news is that you don’t have to go far! 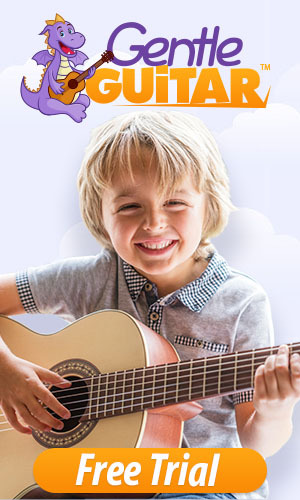 Gentle Guitar™ online school has special guitar classes for kids ages 5 to 8. Our specialist teachers teach the lessons to you and your child right in your home via a Skype video call. Kids love to learn guitar at home. They feel it’s a safe and comfortable environment. 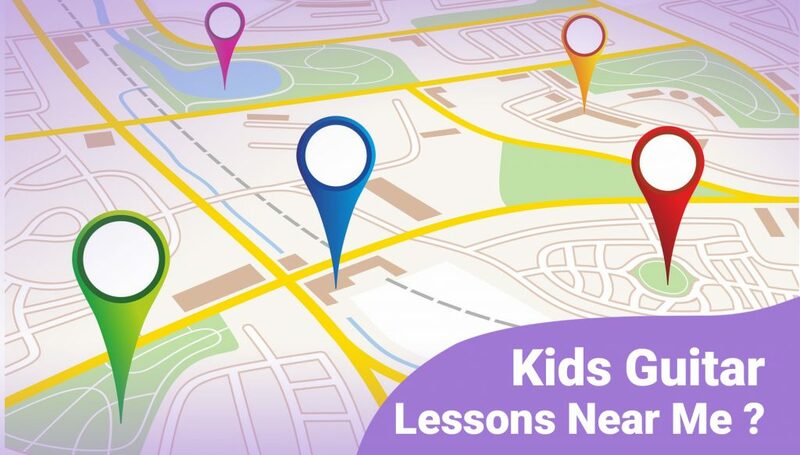 As a parent or family member, you get to participate in the lessons. It’s fun and easy and you get to learn along with your child. What about Skype lessons for older kids? Our Skype guitar lessons work amazingly well for beginners of all ages. The secret to great Skype lessons is in the training and experience of the teacher giving the lessons. All our teachers are trained to work with beginners, and especially with kids and teens. Here at Gentle Guitar™ school we are passionate about good playing technique. We teach both modern and classical guitar technique. We also teach music reading and writing. It’s a professional guitar curriculum with focus on modern and classical guitar playing. 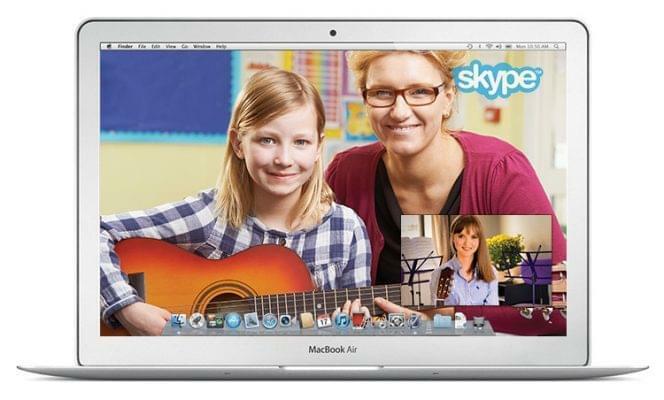 An experienced teacher will teach your child better on Skype, than an inexperienced teacher would at a music school. Not all teachers have the same level of teaching experience. Not all music schools employ trained guitar teachers. Different schools have different employment requirements. Across the USA and other countries guitar teachers are not required to be trained in kids guitar tuition. This makes it very hard to find the right teacher for your child. Before you sign your child up for local guitar lessons, be sure to ask the local teacher about his or her experience teaching children. Ask to see reviews & testimonials and student performance videos. When you are sure that your local teacher has talent and experience teaching children, then you can take your child for a free trial lesson. Most private teachers are happy to offer a sample lesson free of charge. It’s a great opportunity to meet the teacher and assess his or her rapport with your child. As an alternative to lessons near you, try our free Skype guitar lesson for kids. We have over 10 years experience teaching guitar to children ages 5 to 12+. You will be surprised at the quality, professionalism and convenience of our Skype lessons. You don’t loose anything by trying. You and your child will save travel time and enjoy a wonderful learning activity together at home. Lean more about the Gentle Guitar™ Skype classes for kids. When you are ready, book a free trial here. Are Kids Skype Guitar Lessons For You? Skype guitar lessons are not for every family. Some families prefer to drop the child off at the local lesson and wait in the car or run errands. At our school we encourage that you participate in the lessons and enjoy the tuition together with your child. You and your Skype teacher will connect weekly and work together as a team. Then our Skype lessons could be the ideal fit for you and your child. We teach our Skype lessons to kids all over the world. It works amazingly well!